Beautifully decorated ground floor corner villa overlooking the pool and ocean. Master bedroom and living room each open to the screened porch. With the day bed in the foyer, the condo actually accommodates 5 people comfortably. Fully equipped kitchen, 2 Hi-Def flat screen TV's - each with a DVD player and a library of movies (in case of rain). The Links course, one of two Tom Fazio designed courses, is just across the street and the Harbor course is within walking distance. 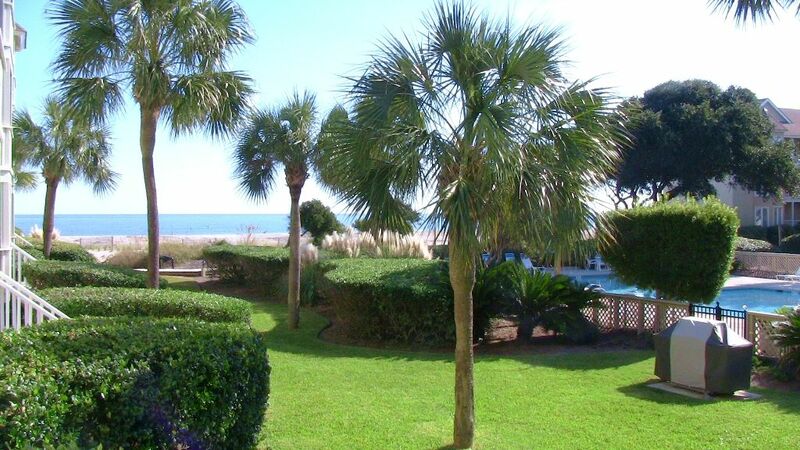 Just 20 minutes from beautiful, historic downtown Charleston.. This villa is 40 steps to the beach and 10 to the pool. You will be 20 minutes from Historic Charleston where you will find world class restaurants, boutiques, antiques, carriage rides through the historic district, bars, pubs, coffee shops and a myriad of shopping on King street. There are cruises to Fort Sumter and around Charleston harbor and the peninsula. This was a great condo with everything you need! Close to the pool and beach which is a huge plus. We hope to come back soon! Amazing trip to Isle of Palms! We had the best time and Linda and Lou’s condo! It was clean, had everything we needed to cook, a perfect spot for our baby to sleep and right by the pool and beach. Wonderful hosts! Also, close to a lot of fun spots! Appointed with everything needed. Towels, beach stuff, chairs etc. the weather did not cooperate for us to enjoy the beach but everything you needed was available at your finger tips. I look forward to coming again very soon. Everything you could need on a beach vacation. Just bring food and clothes! Lou and Linda's place is amazing! So well kept and the most well stocked VRBO vacation spot we have ever stayed at. Our 2 year old loved the day bed and we really appreciated that Lou and Linda had child bed rails available (we forgot ours at home). So close to the pool and beach, ideal when having to go back and forth with a 2 year old. We hope to stay again next year! Honestly everything was great and our family can't say enough positive things about this stay. Thank you for the great review, Chelsea! We try to think of everything to make your stay enjoyable. We accept Visa - MasterCard - Discover - American Express Except for the stated rates and accommodation taxes there are no other fees or charges. There is, however, a $100 cleaning fee for 2 night stays. Although the rates do not reflect a 2 night stay, they are allowed but you must contact the owner in advance.